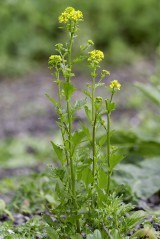 Winter Cress is winter green biennial or short lived perennial growing to about 30–60 centimetres tall. There are a number of cabbage like plants with four yellow petals but this one can be identified by its relatively small flowers, the clasping upper stem leaves and the shiny dark green basal leaves. The stem is ribbed and hairless and the fruit pods are long, narrow and upright. Flowering occurs form April through to July. Winter Cress is a common and widespread native of non-acidic damp soils and is found in a variety of habitats such as the banks of rivers, streams and ditches, roadsides, hedges and waste places. Because of its relatively short lifespan and its need to propagate by seed it requires a degree of disturbance, like human activity or seasonal flooding, if populations are to be maintained. Probably best sown in the autumn. The seed exhibits hard coat dormancy and a period of chilling can help to break this. Germination can also be speeded up with a light scarification.